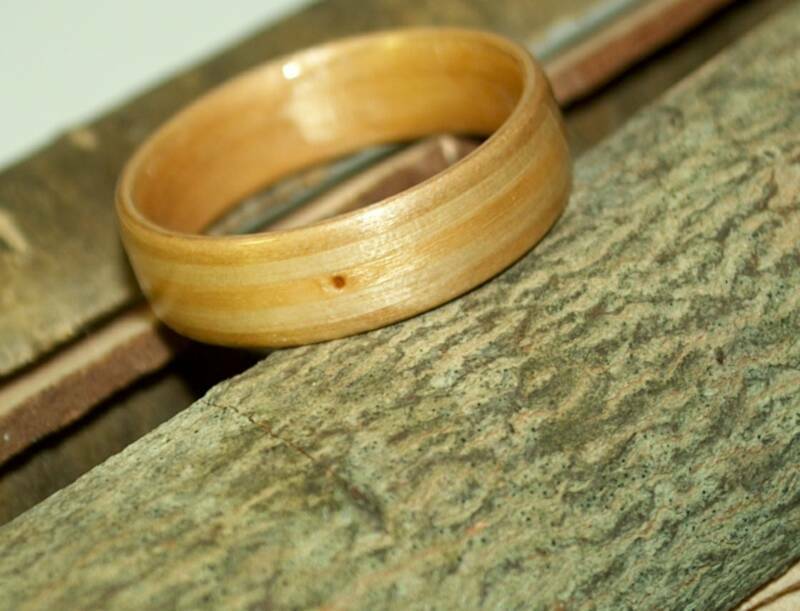 If you have a special piece of wood or a small limb from a tree that is dear to you, David will happily work with your own wood to create a ring in a style of your choosing. The ring on the left was created from orchard wood which was gathered secretly to have the ring be a surprise. The ring is made of their own cherry, ash and maple woods. It is shown sitting atop the wood it is made of. Stacie and Dave sent us two tiny branches from their Silver Maple 'engagement tree' which David incorporated as inlaid bands on their dark koa wood rings. Their rings are 6.5 and 3.5 mm wide with wide bands of silver maple wood.